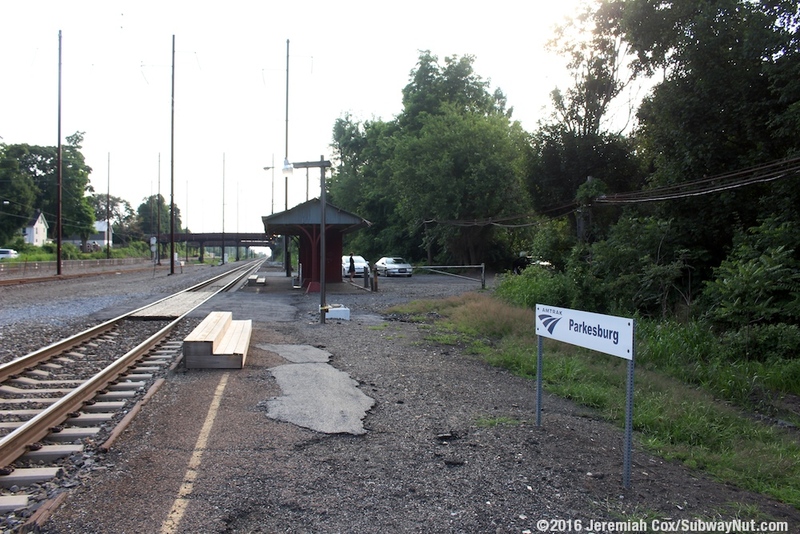 Parkesburg is a station on the Keystone Service that was the terminus of some extended SEPTA Paoli-Thorndale Line commuter rail trains from 1990 until November 10, 1996. 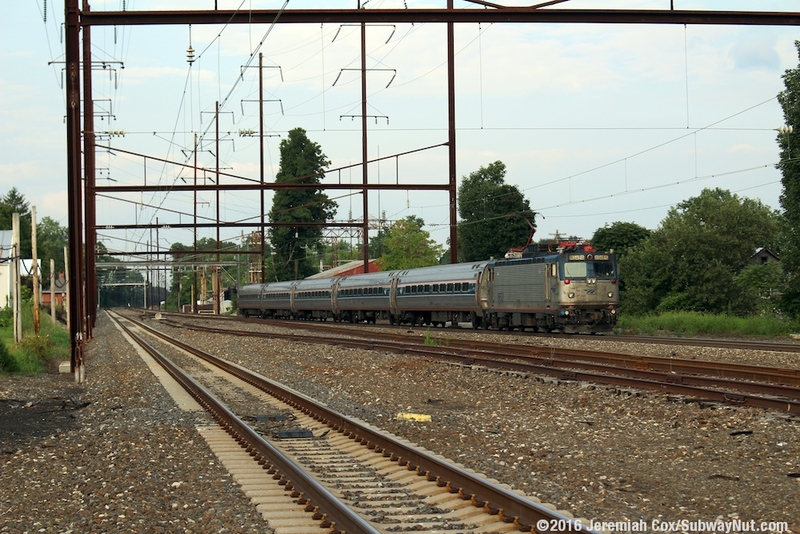 These trains were pushed back to Thorndale because trains were deadheading the 18 miles each way to and from Lancaster to layover and relay, a waste of resources. 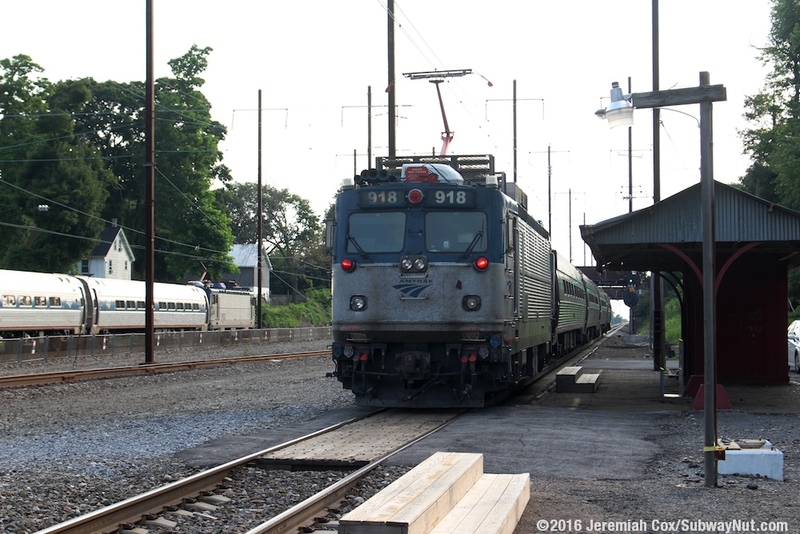 Today it is a local stop on the Keystone Service that is skipped by some weekday trains along with the Pennsylvanian. 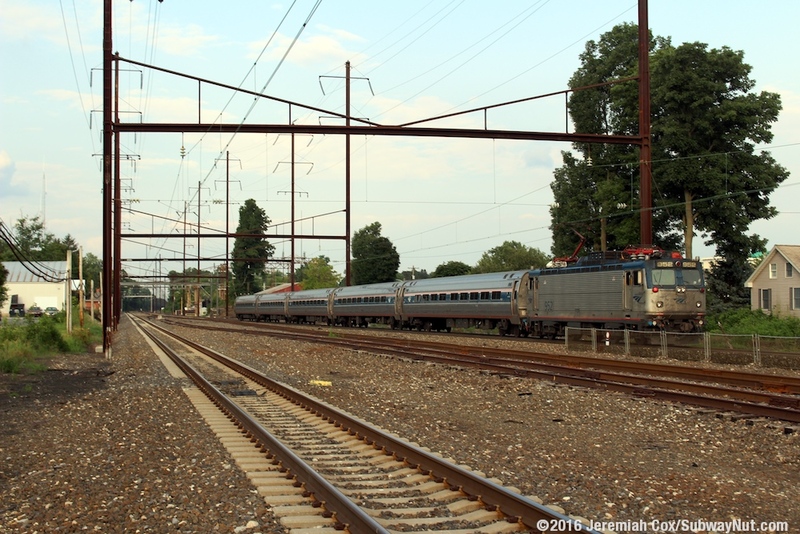 The line here is extremely wide, perhaps where 5-6 tracks were during the Main Line's heyday. 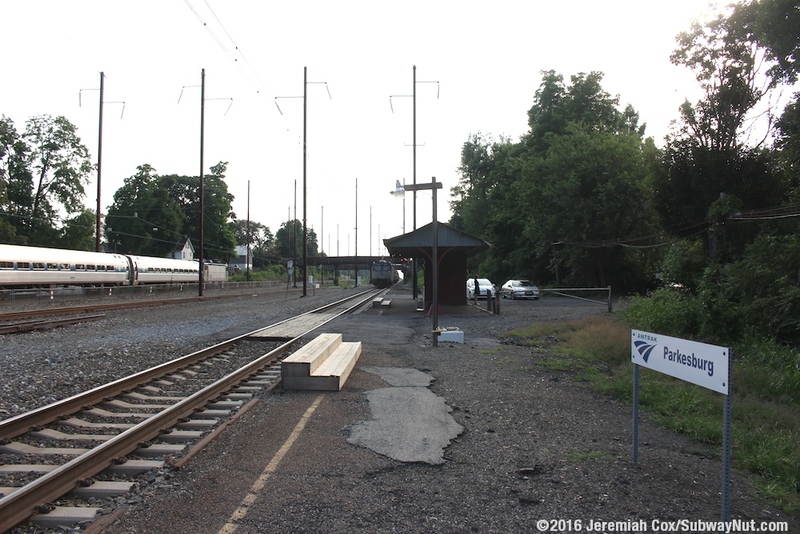 Today there are just two electrified tracks in regular service (with modern concrete ties) and a third siding track in the middle. 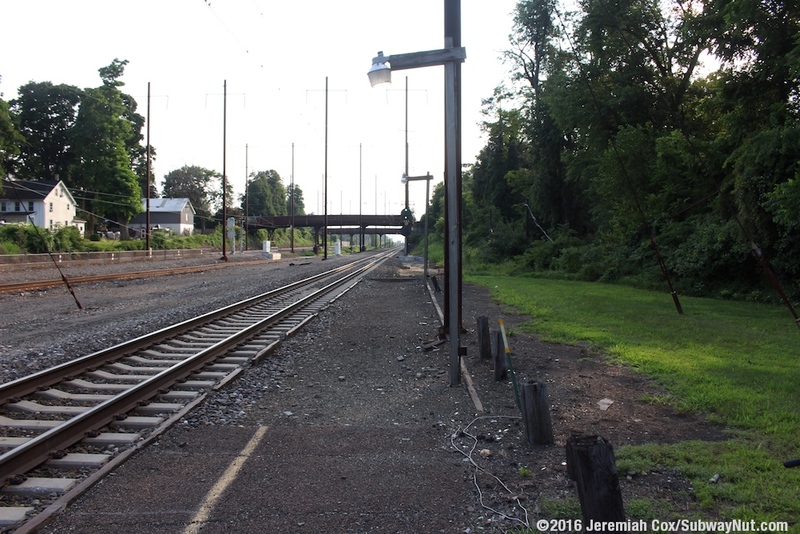 Fencing tries to keep trespassers from crossing the high-speed tracks between the two low-level side platforms. 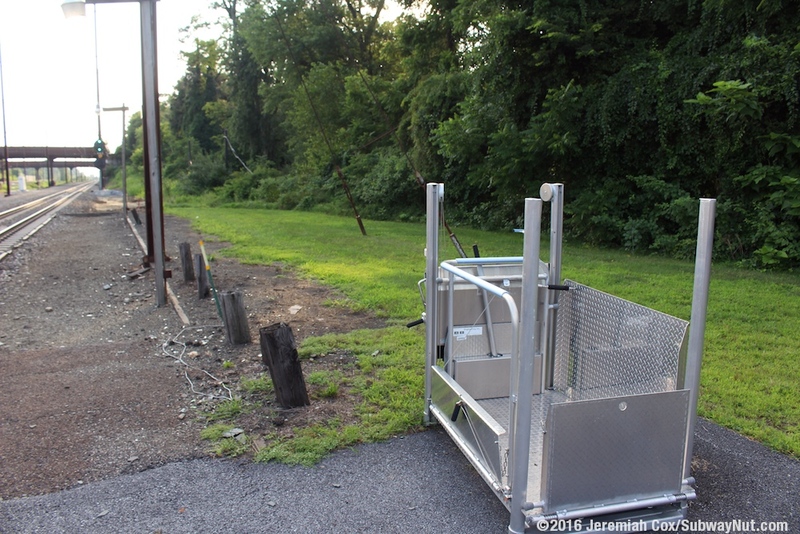 The platforms each have a mobile-lift sitting on them but have no real ADA accessible path between the platforms without rolling down local streets with possible steep grades. 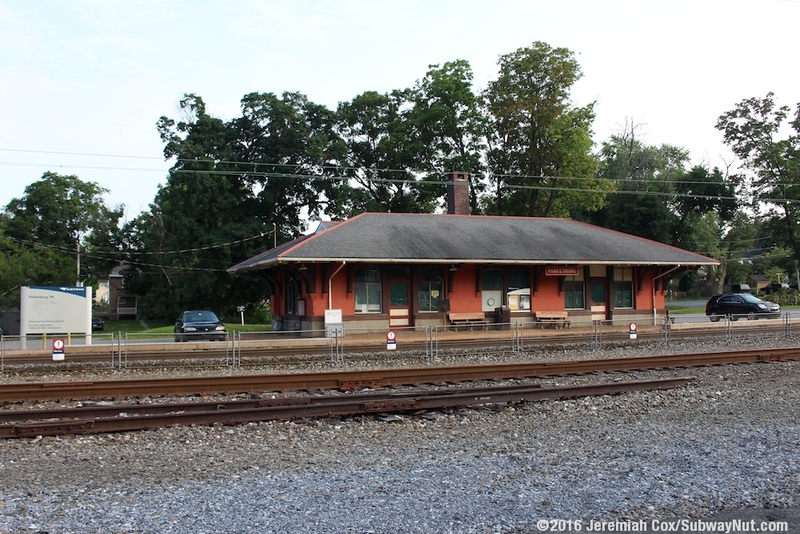 The station has a historic 1905 depot that was leased from Amtrak to the local chapter of the National Railroad Historical Society to avoid further destruction. 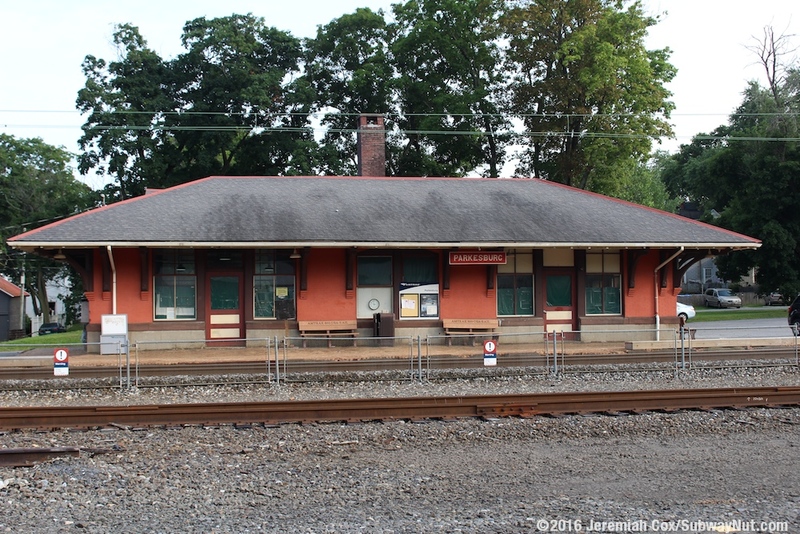 The HRHS had it's roof repaired and then leased the station back to Amtrak as a field office for Keystone Corridor improvement projects. 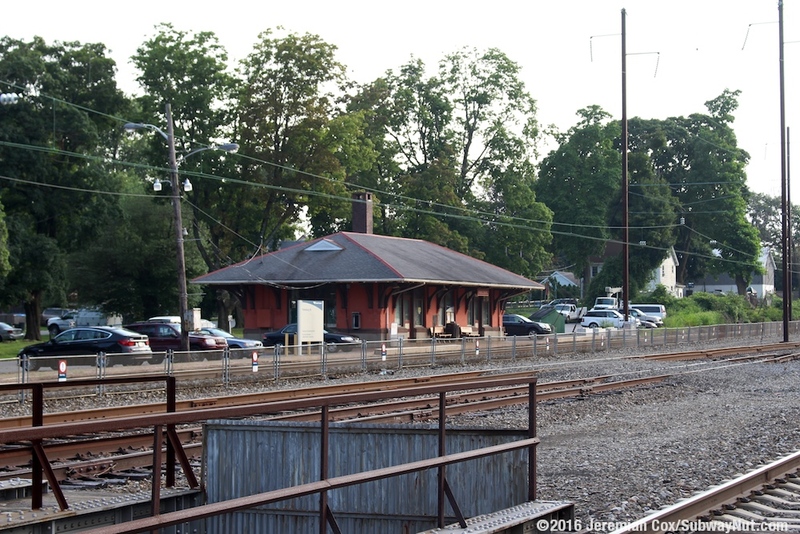 This single story brick depot is painted pink and has a slightly overhanging roof that provides all shelter to passengers waiting on this platform. 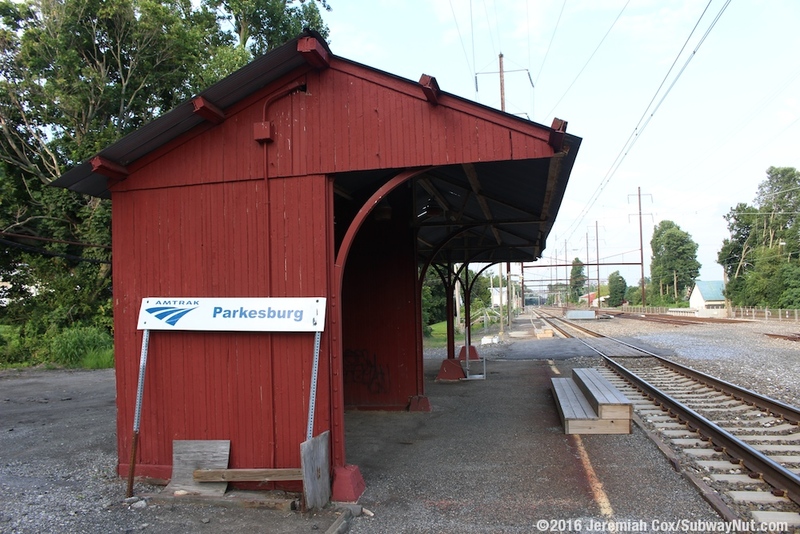 Painted Parkesburg signs add to the historic feel. 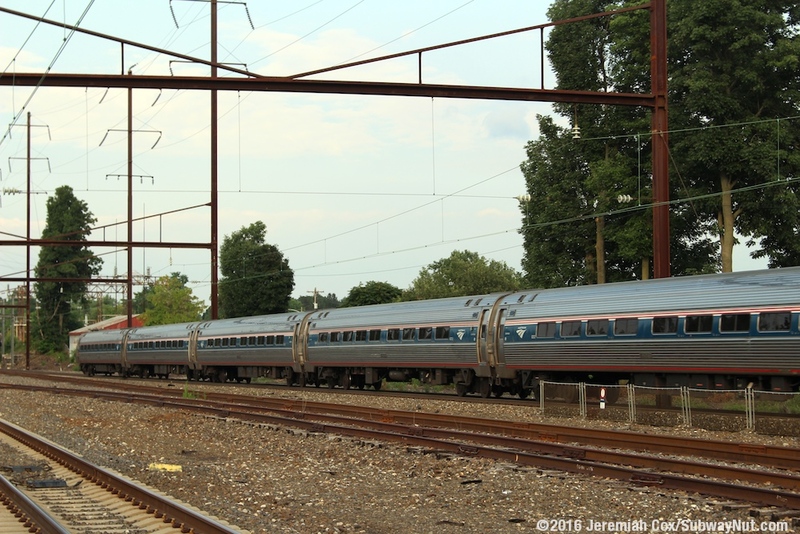 For boarding trains there are two sets of wooden steps that align with two sets of doors on two different Amfleet cars used by the Keystone Service. This extremely low-level platform is still made of brick. 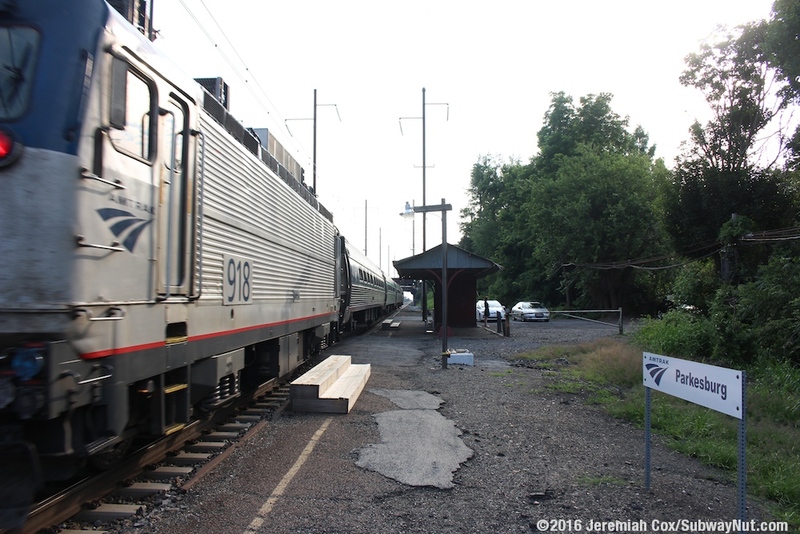 Benches along the depot have Amtrak 1-800-USA-Rail etched into them. 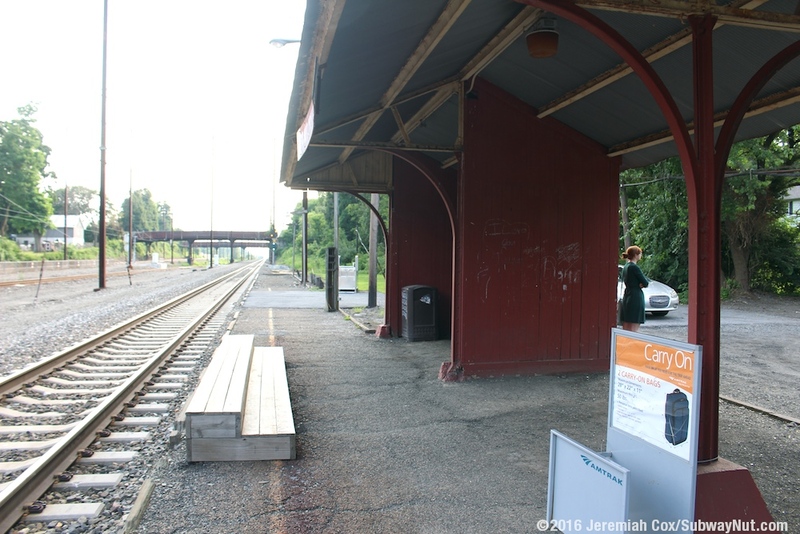 There is also a standard freestanding Amtrak information kiosk, and some more train information panels in windows of the depot (one has a cleverly designed clock in the window). Surrounding the depot is small parking lot with 40 long-term parking spaces. Grass divides the parking lot from nearby Maple Street with two driveways for access. 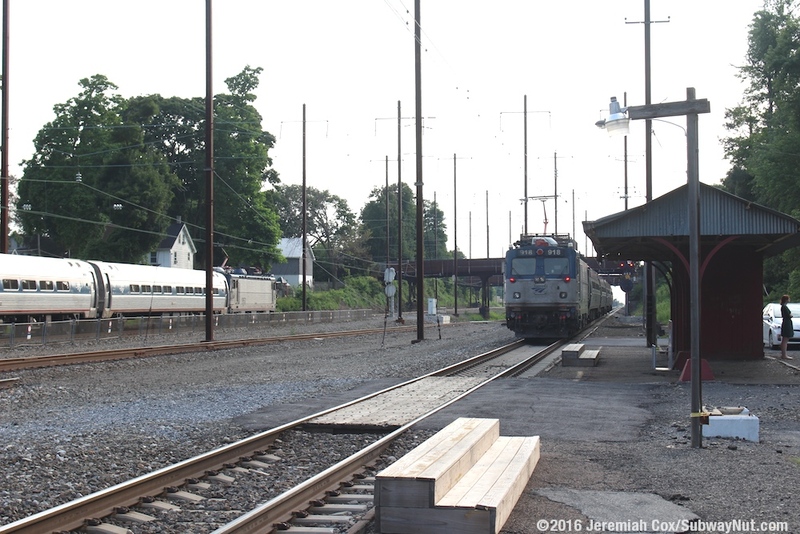 To reach the Harrisburg-bound platform, passengers must leave the east driveway, cross Culvert Street to the side of the street that has a sidewalk, (the side most convenient to passengers lacks one) and go through a narrow underpass tunnel of Culver Street beneath the tracks. 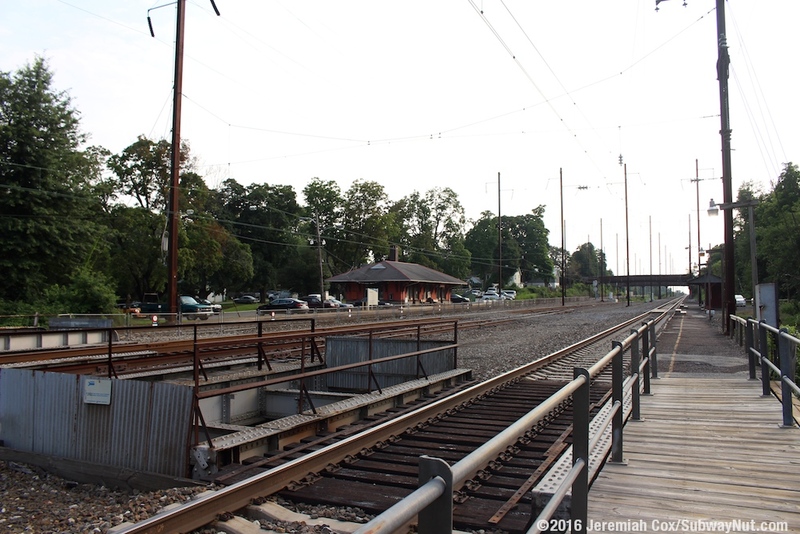 There is then a wooden staircase (there were once staircases on both sides of the street) up to a walkway that crosses back over Culver Street and passengers reach the small shelter/canopy for Harrisburg-bound passengers directly across from the depot. This structure is also painted red, and two-thirds is just a canopy, with a small shelter area having wooden walls. 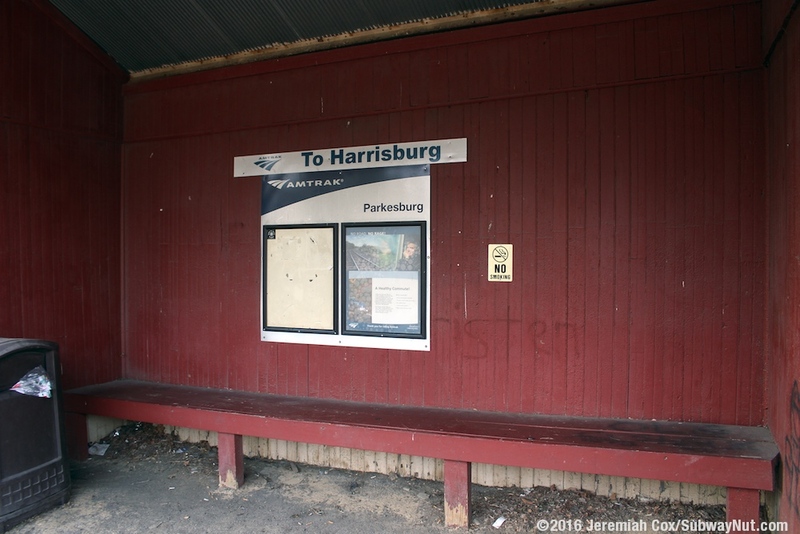 Inside the wooden area are a wooden bench, and a combined Amtrak Parkesburg sign under two information panels (that had generic information and no schedules when I visited). A final sign does say To Harrisburg. 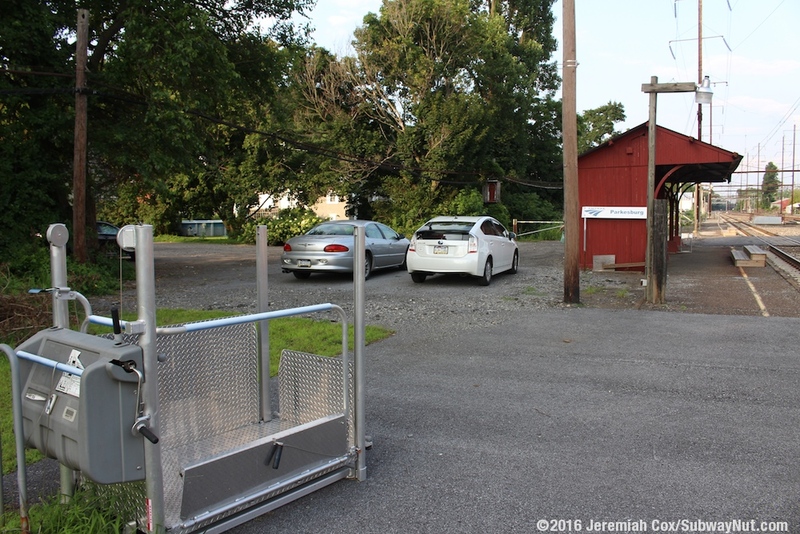 This platform also has street access with Wright Street ending just beyond the shelter (along with a small parking area). 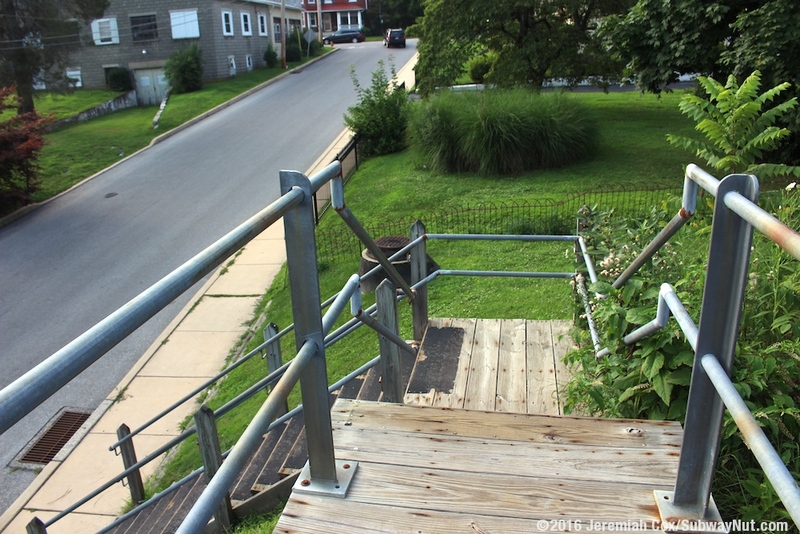 Step-free access to Culvert Street requires going around the block via Main Street.